Arrival: During this brief time many skills are developing as children take care of their personal belongings, greet friends, observe changes in the classroom, and prepare for the day. Activity Period: This is the time for trying new activities, toys, and games as well as developing social skills. The teachers will work with the children individually or in small groups on special projects that will vary from day to day. 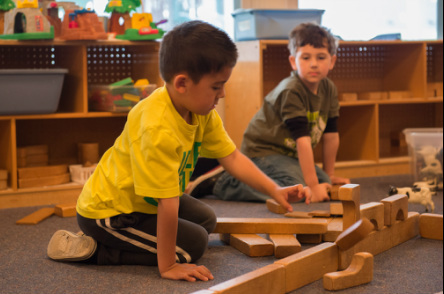 These teacher-planned activities work on skills such as pre-reading, pre-math, art, science, large and small motor skills, language development, and socialization. Clean-Up: The children have the opportunity to sort and classify classroom toys as they put them away in their proper places. They practice self-help skills as they use the bathroom and wash their hands. Snack: This is an opportunity for the helper children to practice one-to-one correspondence as they pass out the cups and napkins. The children have the opportunity to try new foods or foods that they have helped prepare. Circle Time: During this time children have the opportunity to experience things as a group. 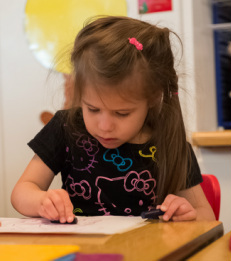 They hear stories, sing songs, learn fingerplays, dance, play instruments and participate in other activities that work well in a group setting. Outdoor Play: This time of day provides the child with an opportunity to work on large motor skills using his or her whole body. Our well-equipped, fenced playground provides many opportunities for learning and fun.